Liu Chin with your lazy eye, thumb on a cell phone, standing in the shadow of a man. is like buffed candle wax compared to mine. Arrival, Departure, you keep us on track, gathering passports, collecting airport tax, riding baggage carts around the bend. Liu Chin with the lazy eye, thumb on a cell phone, standing in the shadow of a man. you skip stones over the clear river water, reflections of weeping trees juggle for postion. You, Chin with the lazy eye, thumb on a cell phone, standing in the shadow of a man. is you. In a small room while our group ate dinner you did an impression of a baby bird accidentally falling into the river. I see those wings I see the bird, big, but young, each layered feather in various hues of gray and black, the bend in his wings, flopping. This entry was posted in China, drawings, Poems, Sketchbooks, Travel Drawings and tagged Cell Phones, China, drawing, feather, Guiyang, Guizhou, illustration, Mobile phone, poetry, Rural society in China, Science and Technology, suona horn, Travel, Visual Arts. Bookmark the permalink. Thank you Karen. I do like the pairing of an old drawing I made with the poem I wrote a few years ago. It makes the experience fresh and new again. This is beautiful and it fits so well with the drawing. Really so good. I’m really pleased you like the poem. I hand held the camera because I couldn’t find the attachment that goes from my camera to the tripod.The shot could be sharper. 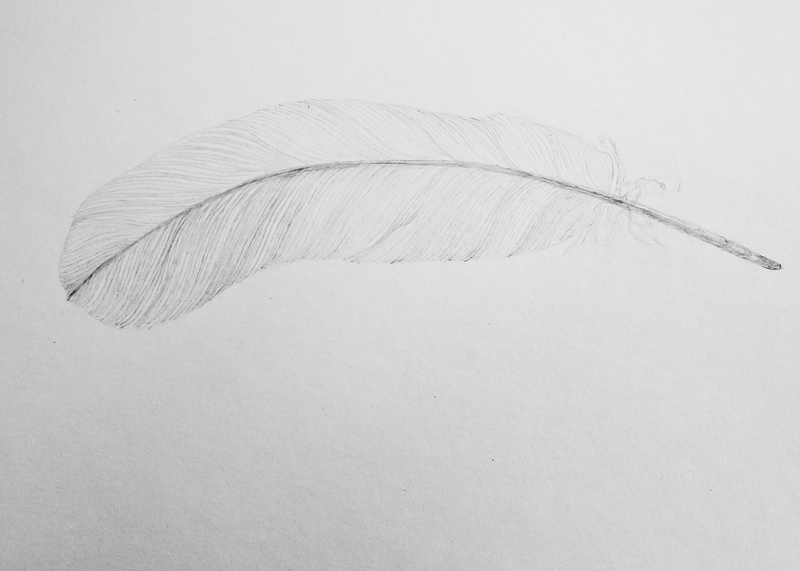 The feather was drawn years ago, way before my trip to China. The other comments have already said it, this is just beautiful, both the delicate drawing and the very touching and personal words. I can feel your spirit in both of them – and feel connected through them. Reblogged this on Carla's Blog. A memory so delicate and visual. Gorgeous poem…I love that bringing it together with the older drawing allowed you to have a fresh take on both. And also that you thought to focus on Liu Chin at all – that is a good thing. Just as sensitive, thoughtful and artfully done as your paintings. Exquisite! This reads absolutely beautifully, like droplets of water falling off stone..